Klim Short Induction Introduction - Airflow, meet Protection! Airflow and protection are not usually uttered in the same sentence when talking about motorcycle gear. They are usually mutually exclusive, you can either have one or the other. The Klim Induction gloves bridge the gap by offering durability, comfort, AND protection. Pair the Klim Induction gloves with the Induction Jacket to get lots of airflow on those hot summer days. The Klim Induction Gloves provide airflow through perforated leather and textile mesh. The premium grade perforated leather along with the 1000 Denier Mil-Spec mesh provide protection while still flowing air. Pittards Armortan ceramic-reinforced leather on the palms, a carbon fiber knuckle and Poron XRD Extreme Impact Protection foam round out the defense against injury. This short glove provides ample protection without the extra material of the gauntlet from the Induction long gloves heating up your wrists. Sometimes you just want to feel the wind through your wrist hairs. Hot hands are a good thing in basketball, but a bad thing on a motorcycle. Don't risk riding bare-handed in warm weather. Invest in a pair of Induction gloves to protect your digits. 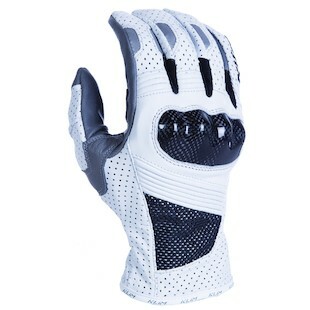 The unique combination of materials will keep your hands cool and protected.